More people need to step up. When we take responsibility for making change wherever we can, not only does it make our companies, communities, and the world better, but we are happier and more successful and have more fulfilling relationships. But all too often, we stop ourselves before we start. The problems seem too daunting, it's another department's responsibility, other people are the issue and we can't change them, and so on. And so nothing ever changes. 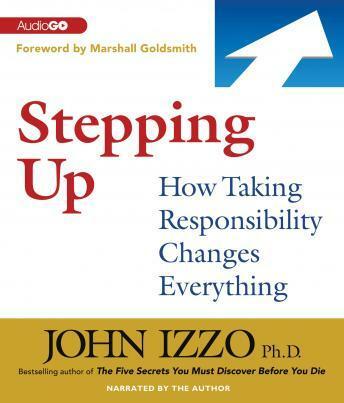 With his distinctive mix of inspiring storytelling and practical advice, John Izzo compassionately demolishes the most typical excuses, helps us see a way through common roadblocks, and enables anyone, anywhere, anytime to effectively bring about positive change by simply stepping up. Through numerous examples, Izzo shows that when one person steps up, it creates a wave of energy that encourages others to join in. Rather than regaling us with stories of extraordinary people and extraordinary deeds, Izzo tells us about regular people who see problems and decide-sometimes hesitantly, often uncertainly-to take that first step. Like them, each one of us can claim our power to change the world. From the bestselling author of The Five Secrets You Must Discover Before You Die.